Iberdrola and Nike have agreed their third clean energy power purchase agreement (PPA) in three years, setting their sights on Europe for the first time. The new PPA will build on the success of previous agreements between the two companies in the US. In total, on both sides of the Atlantic, the global sporting brand now benefits from the supply of over 200 megawatts (MW) of renewable wind power. The new agreement will see Nike facilities in Europe supplied by 40 MW of clean electricity from the Cavar wind complex in Navarra, northern Spain. Iberdrola will soon start construction on the complex which will see four projects completed by 2020 with an overall capacity of 111 MW. “All athletes need fresh air and clean water to thrive. Delivering on our sustainability commitments, like working towards 100% renewable energy across our owned and operated facilities worldwide, is just one of the ways we protect the future of sport,” said Noel Kinder, Nike Chief Sustainability Officer. In 2018, we announced that we had contracted for 100% renewable energy in North America, and this latest agreement means we will be operating on 100% renewable energy across Europe by 2020. This means we are delivering against more than 75% of our worldwide goal. 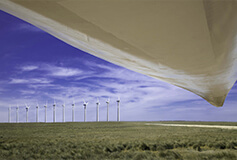 In the US, the deals between Nike and Avangrid Renewables (a subsidiary of Iberdrola) include 100 MW of wind power supplied from the Karankawa Wind Farm (Texas). Additionally, a service for Nike's Global HQ in Oregon delivers renewable supply from the nearby Leaning Juniper and Juniper Canyon wind facilities, with an equivalent capacity of 69 MW. This capacity will enable Nike to source 100 percent renewable energy across their owned or operated facilities in North America. Iberdrola and its local partner Inversiones Financieras Isla de Tenerife (IFIT) have inaugurated the Chimiche II wind farm, their first wind farm project in the Canaries.